An out of ordinary mix of both must-see and off the beaten track itinerary. An Italian Tour crafted to experience the Italian life and to combine visit of the best places and experiences of the authentic Italy, with its wealth of art, culture, wine and food treasures, breathtaking landscapes, great art cities. 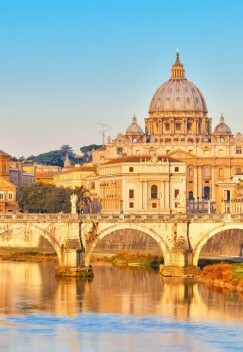 The tour features the 3 must-see beautiful art cities (Rome, Venice, Florence), with Tuscany countryside and medieval towns (Siena, Chianti, Pisa and Lucca), and the beauties of the Amalfi Coast (Pompeii, Sorrento, Amalfi, Positano, Ravello and Capri). A complete exposure to Italy and its culture. 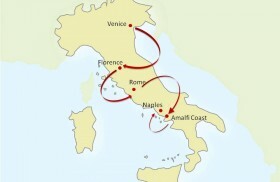 The unique atmosphere of Venice and its Lagoon, the works of art of Florence, the “great Beauty” of the eternal city and the breathtaking sceneries of the Southern Coast. Live the unforgettable exclusive Italian food experiences: have fun cooking an Italian meal, enjoy genuine Italian dinners in restaurants where locals eat, taste the excellent wines of Chianti and a typical “Tuscan lunch” in the countryside, visit a winery on the Vesuvio slopes … Enjoy “la Dolce Vita” in the best places of Italy! 12 Nights Accommodation in exclusive and fascinating 4/5 stars Hotels or Historical mansions, with full buffet breakfasts: 2 Nights in Venice, 4 Nights in Florence, 3 Nights in Rome, 3 Nights in the Amalfi Coast. 3 Lunches (in a Chianti winery, on the Vesuvio slopes and at the end of the cooking class) and a Welcome Dinner in an exclusive restaurant. 2 beautiful wineries visits and exceptional wine tastings: in Tuscany and on the Vesuvio slopes. Exclusive Italian Cooking Class with an expert English speaking Chef, with local food market visit and shopping. Tuscan Lunch in a typical farm inn in the countryside. Private sightseeing Tours with expert local English Speaking Guides, including all the entrance fees to the sites visited, with preferential skip the line access: Venice – Florence (Accademia Gallery) – Rome (Colosseum, Roman Forum, Imperial Fora, St. Peter’s Basilica, Vatican Museums and Sistine Chapel) – Pisa (Leaning Tower) – Pompeii – Amalfi Coast (Amalfi, Positano, Sorrento and Ravello). Full Day Excursion Siena and Chianti. Full Day Excursion Amalfi Coast. Boat Tour of Venice Grand Canal. 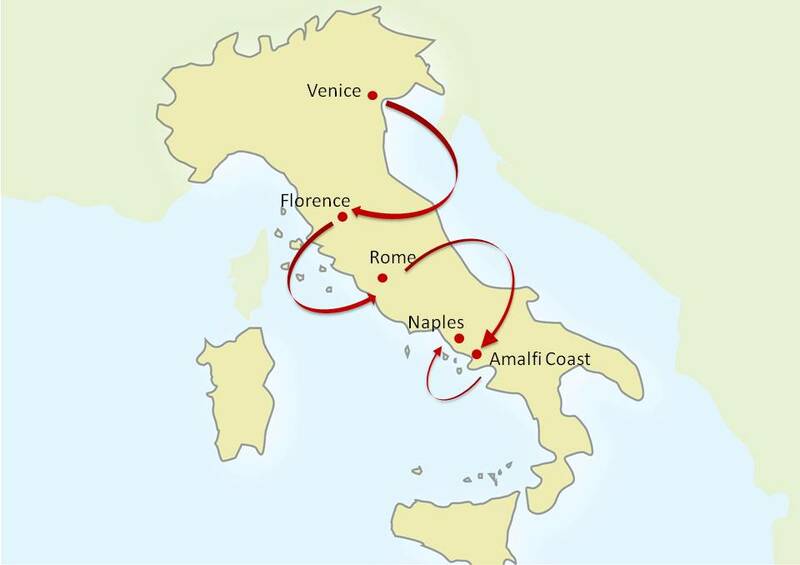 High Speed Train Venice – Florence – Rome – Naples: 1st class tickets and seats reservation. Tour begins in Venice and ends in Naples. Guided Tour of the city highlights: St. Mark’s square and Saint Mark’s Church(rare example of Byzantine art with its golden mosaics), the Doge Palace (living witness of the history, art and culture of the Venetian Republic) and then through the small calle (the typical Venetian streets), out of the beaten tourist areas. Boat Tour of Venice Grand Canal. Explore this fantastic city, renowned for the beauty of its setting, its architecture and its artworks. Venice and its Lagoon is entirety listed a World Heritage site. Exclusive Welcome Dinner. Private guided Tour through the historical centre of Florence to admire the city landmarks privileging its most characteristic corners. Visit the “Accademia Gallery” to stand face to face with Michelangelo's David. Special day in the typical Tuscan Countryside. First stop: Siena, a very beautiful medieval town, famed for the "Palio", the annual historic horse-race and for the gorgeous cathedral with its coating of white-black marble. Next stop: Chianti area, the gorgeous countryside of Tuscany. Enjoy the scenic drive, surrounded by rolling hills, vineyards, olive groves and light Lunch with wine tastings in a celebrated winery. Excursion to Pisa, one of the nicest and most ancient Tuscan art cities of Italy with its absolute masterpiece of Italian art: The Campo dei Miracoli (Field of Miracles) where you will admire the Cathedral, the Baptistery and the Leaning Tower. Then take a walk in the narrow streets and on the top of the Medieval Walls of the city of Lucca. Enjoy the Roman life and admire the Eternal City highlights with a private guided Tour with an out of the ordinary itinerary: in addition to the must see highlights go along the traces of Ancient Rome. Visit one of the most beautiful churches and museums in the world: the St. Peter’s Cathedral, Vatican Museums and Sistine Chapel with the incredible Bernini Dome and the Michelangelo’s Pietà. Unique Italian life & food experience: grocery shopping at one of the nicest open air markets and then cooking class in a beautiful apartment close to Piazza di Spagna! Lunch with your own made Italian meal. Private guided Tour of the Archeological site of Pompeii where you will be able to admire some of the most beautiful existing Roman frescos. Wine tastings and Lunch in a beautiful wine estate located on the Vesuvio slopes. Private Excursion on the Amalfi Coast along the breathtaking scenic Amalfi Drive. Visit Sorrento, a renowned resort since Romans times; Amalfi, its lively and colourful alleyways, its lemon trees, and the gorgeous Cathedral; Positano, with its pink and fuchsia houses, flowering bougainvillea and picturesque square; and the breathtaking view of the Gulf from Ravello. Special boat Excursion to the beautiful island of Capri, much loved by intellectuals, artists and writers, all captured by its magical beauty. The Grotta Azzura (blue cave), the famous “Via Krupp”, the “Fortini” (little forts) trails. Shopping and relax in Marina Grande.